If you’ve so much as poked your head through the door of Planet Coaster’s Steam Workshop you’ll have glimpsed the glittering array of setpieces players have put together using the game’s design tools. From the building blocks of western parks, users have created temples and pagodas – inspiring the game’s latest official pack, World’s Fair. Out October 16th, the World’s Fair pack takes in themes from China, Japan, France, Morocco, Italy, Germany, Mexico, Spain, the UK, and the US – introducing locally styled shops, restaurants, billboards, and scenery items. Over 300 new building pieces provide the basic blocks for a swathe of ambitious new Workshop creations. It’s not all on players to prepare the meat of this £7.99 pack, however. Two motorcycle coasters, the Jixxer and Interceptor, showcase a hydraulic launched track type in which riders lean into the corners at breakneck speeds. Though hopefully not literally breakneck – there are park insurance rates to think about. Thankfully the bikes don’t come off the tracks, but a new transport coaster named Polarity introduces another way to whizz patrons about your parks using the power of magnets. And before all that, a free update today brings restaurants, vending machines, and a variety of gameplay and quality of life improvements. 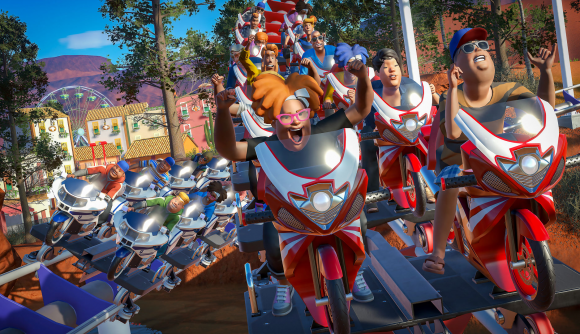 Planet Coaster is still rattling down the tracks after selling more than a million copies in less than a year. It’s now nearing the end of its second.